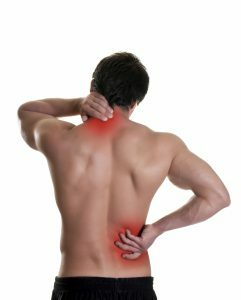 Absolute Wellness Center offers many different treatments for what is far too common a complaint among our patients: back and neck pain. Some patients respond best to physical therapy and rehabilitation, others to chiropractic treatment, acupuncture, or massage. Chiropractic medicine is often one of the fastest and most effective treatments for one of the most painful causes of back pain – a compressed or herniated disc. Intervertebral discs provide cushion between each vertebra and are also partly responsible for enabling the spine to move and bend. The discs contain a gelatinous middle and a fibrous outer covering. When an injury causes a rupture, bulge or undue compression of a disc or discs, the inner jelly presses out and can pinch nerves traveling from the spinal cord to the other areas of the body. This can lead to back pain, sciatica and other spinal conditions until the disc is moved back into place. Many people afflicted with disc problems immediately consider painkillers and surgery, but both of those options can also cause complications. Our doctors have helped many patients like this avoid back surgery and leave painkillers behind with spinal decompression. This type of treatment provides a complement to traditional chiropractic adjustments and improves pain management during a patient’s healing. 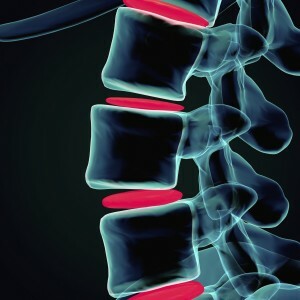 Spinal decompression is similar to general traction, but it is more targeted and precise. After a complete diagnosis of the nature of the problem within the spine, when appropriate, the patient is gently secured to our flexion-distraction decompression table. The table then engages the spine in gentle, focused stretching and releasing motions over the course of several minutes. The first thing a patient notices is that the treatment is comfortable and relaxing and it immediately begins to relieve their pain. However, pain management is not the only goal of spinal decompression therapy. 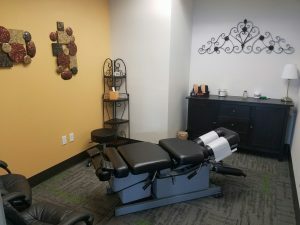 Depending on the severity and condition causing the back pain, our chiropractic physicians sometime recommends a series of spinal decompression treatments over the next few visits. This is generally done for two reasons. First, decompression helps to stretch the disc back into its normal shape. Second, the gentle stretching actually creates a vacuum effect inside the discs, which suctions new circulation and nutrients into the disc to help replenish lost fluids and begin cellular regeneration to heal the disc. In some cases, patients seriously considering back surgery are able to avoid it through a combination of chiropractic care and spinal decompression. If your doctor thinks surgery is still necessary, he will of course refer you for a surgery consult. However, if you suffer from a severe, unrelenting case of back pain from damaged discs, we want you to be aware of all of the options that will be less invasive than surgery. We have seen so many patients get a new lease on life from this non-surgical, naturally-healing procedure, that we know it can help many more people too. If you are suffering from back pain and think you may benefit from spinal decompression, please call our office at 541-484-5777 to talk with Dr. Michael Herb or Dr. Brandon Beckerman about what treatments may be appropriate to help. You may also be interested in learning more about chiropractic care in general on our Chiropractic Medicine page.